It’s funny, when I sit and think about all the games I’ve played over the years, so many of them have encouraged the use of explosive weapons – whether it’s a causing chaos in DOOM or Luigi sending out explosive remote control cars in Mario + Rabbids Kingdom Battle. Heck even cute little Kirby is seen lobbing bombs at his enemies in Kirby Star Allies. Now if you were to ask me how many games I’ve played where I’m trying to prevent anything from exploding, well then that question is a little tougher to answer. 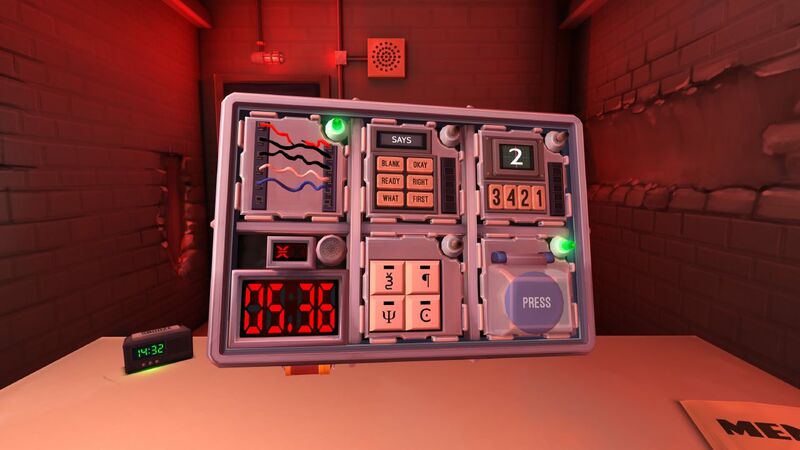 Keep Talking and Nobody Explodes puts you in the shoes of bomb disposal experts, your only objective being to prevent anything from blowing up. Doing so will require quick thinking and more importantly strong communication since you’ll all be playing as a team in one of two important jobs. The player taking on the role of ‘Defuser’ is the only one who can actually see or interact with the bomb whether you choose to display it on a television or in docked mode. Unfortunately, they also have no idea what wires they need to cut nor what buttons and switches to use. That’s where the ‘Experts’ (your teammates) lend a hand, their job being to use the information given by the ‘Defuser’ and offer them guidance using the game’s downloadable bomb defusal manual. Teamwork is absolutely key here with each side needing to pull their own. The ‘Defuser’ needs to be quick to answer questions and accurate in describing what they see whether it’s the colour of a certain button on the bomb or even its serial number. Meanwhile, the ‘Experts’ need to be swift to find a solution, absorbing any information and clearly explaining the correct instructions back to their teammate. The bombs themselves consist of anywhere between one and eleven individual modules, each one essentially a puzzle to solve. The variety of modules in the game is impressive, to say the least, the different tasks involving anything from the memory based game Simon Says to wire cutting or even Morse Code. One of our personal favourites involved nothing more than a giant button where the colour, text on it or even the number of batteries on the bomb influenced how we needed to approach. Do we hold the button? Do we need to let it go when the timer has a 4 within it? What makes a lot of these modules work so well is their dynamic nature, keeping you on your toes and actively encouraging constant communication between the team. The aforementioned Morse Code module is another prime example where both sides of the team will truly be tested – the ‘Defuser’ shouting out dot or dash based on a small light reading and the ‘Experts’ manically trying to translate the word being spelt. You’ll also be faced with what the game calls ‘Needy Modules’, modules that are not a simple case of solving once but instead demand constant babysitting to prevent detonation. They’re neat wrinkles that up the tension even further as now you need to multitask in order to survive. The game introduces new modules and raises the difficulty at just the right pace in the main mode slowly adding more puzzles, stripped away time and limiting the number of mistakes you’re allowed. By the finale, you’ll be faced with bombs where even a single error can mean game over. The Free mode also allows you to customise a bomb to dispose of, ideal if you just want to jump in and get right to it. Of course, you’ll need at least two people for keep Talking and Nobody Explodes, the game not designed for someone to tackle alone (without extreme difficulty that is). You’ll also need a copy of the defusal manual in some form too. We found the best experience to be with two or three handling the role of ‘Experts’ using a physical printed copy of the manual. There’s something far more satisfying about flicking over physical pages than merely using a PDF document via smart device or laptop. Not to mention far more efficient. In fact, we went all out and gathered our printed pages within a folder just to make it more official (or at least try to). The PlayStation 4 and PC versions might offer VR support (a fun but expensive feature) but the Switch release feels tailor-made for the game thanks to the device’s portable mode. In fact I’d imagine this feels like the truest bomb disposal experience, making your ‘Defuser’ feel isolated from his or her team. As much as I love Mario Kart 8 Deluxe or Puyo Puyo Tetris they really need to be in docked mode when dealing with a group, the action far too small on the Switch’s 6-ish inch screen. Keep Talking and Nobody Explodes is the perfect party game as it doesn’t require the bigger screen of a television – quite the opposite in fact. It feels perfectly suited to the Switch’s portable capabilities essentially allowing you to play the game whenever and wherever you like. I love a good teamwork-focused party experience and Keep Talking and Nobody Explodes easily ranks among one of the best examples out there. The puzzles are satisfying to solve for everyone involved even fifty or so bombs in and the use of a physical manual outside the game is an ingenious idea. Sure I might have fun blowing things up in video games but Keep Talking and Nobody Explodes has proven I can have just as much fun doing the opposite.